Tarps Direct's vinyl coated mesh tarps are a 10 ounce weight with an 11 x 11 weave count that offers fifty (50) percent shade. The tarp has heat sealed seams with web-reinforced hems and brass grommets in the corners and on all sides that are approximately 24" apart. This product is great for fences, contract work, dump truck covers, trailers, wind breaks, agricultural and industrial applications. 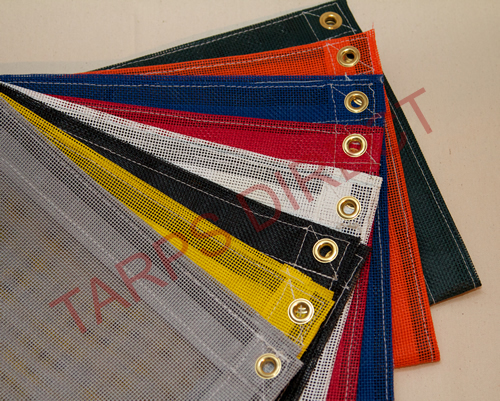 With 10 different colors available, there is no reason you can’t find the perfect mesh tarp! Multi-color also available for a more economical alternative. Vinyl coated mesh tarps are great because you get the benefit and strength of mesh, yet you receive the added durability from having a vinyl coating. Mesh is a strong fabric, yet it has the ability to tear or fray after a certain amount of time. Vinyl is very protective but not very strong. They are good on their own, but they are great together. One specific use for these tarps is on fences. Whether it is for work, school, or athletic fields like baseball or tennis, these tarps provide great protection and durability. Landscaping companies also get great use out of vinyl coated mesh tarps. They can use them to shade certain plants or as a layer in certain beds. No matter what your use, this tarp will get the job done!